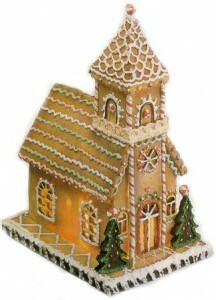 Make this beautiful Gingerbread Church complete with steeple and lovely decorations. Lighting: Cut a hole in the Styrofoam for a light bulb. Glue your house pieces together with thin consistency royal icing (Thinner icing soaks in and your house lasts longer before it dries out and falls apart. It should last several months. Windows: Cut windows in your rolled out dough pieces. Add yellow crushed hard butterscotch candies. The candy melts while the gingerbread pieces bake. Continue reading here!